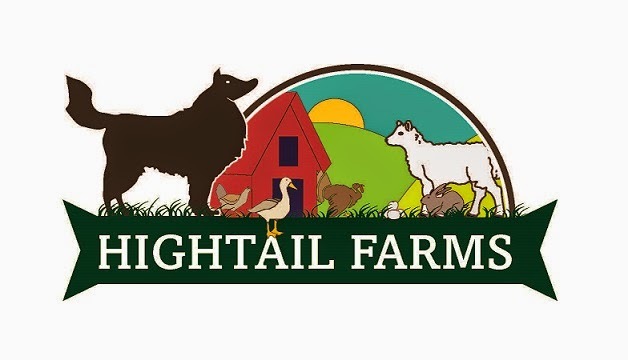 HighTail Farms: If a tree falls in the pasture and no goats are around, will it still be dinner? If a tree falls in the pasture and no goats are around, will it still be dinner? About a month ago we had a large tree go down in the back pasture. The goats just thought this was manna from heaven. The trees come to us?! This is great! Even the kids were getting in on the buffet. As you can see, this was not a small tree. The trunk actually snapped in half about 8-10 feet in the air. It looks like this tree may have fallen victim to some kind of rot or termites. Of course, I saw this as a training opportunity for the pups. I've been asking Luna to climb up, walk on, and jump over weird things her whole life so when I asked, she jumped up into that tree lickety-split! Rialey was game to give tree climbing a go as well. Here I am guiding her a little higher up on a rather narrow branch while making sure she doesn't fall (...again...oops!). She was quite happy to be lifted down afterwards. Meanwhile, the kids didn't need any help getting up or down the fallen trunks. Heck, they even started climbing each other! You are right. This is a huge trunk. However I’m glad to know that no animals were harmed and that all of them are having fun feasting on it. This is a beautiful dog. Its a very nice place to live near a forest with green trees and having cattle. This is the best life villagers live.